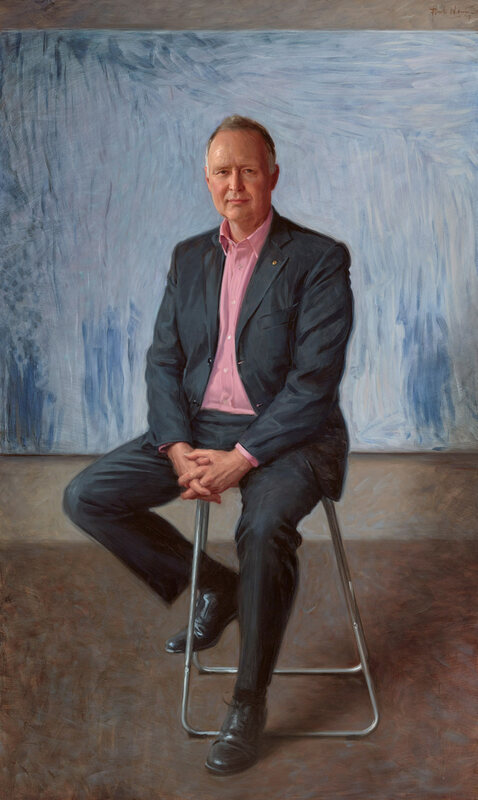 Rupert Myer is chair of the Australia Council for the Arts and former chair of the National Gallery of Australia, Opera Australia Capital Fund, Kaldor Public Arts Projects and the NGV Foundation. He is also a passionate philanthropist. ‘During our sittings, I encountered a charming, urbane man and enjoyed delightful conversations with him about his life-long passion for the arts. He spoke about Indigenous artist Sally Gabori and the profound effect her work has had on him. The work of hers which I painted, albeit crudely, in the background is one that Rupert had in his Australia Council office,’ says Paul Newton. Newton is a well-known, much-commissioned artist. This is his 12th time in the Archibald Prize. In 2001, he won the Packing Room Prize and People’s Choice for his double portrait titled Roy and HG . His work appears in institutions such as the National Portrait Gallery and Princeton and Columbia Universities.